Most healthy people will have existing levels of CO in their blood between 0 and 10 parts per million (ppm) as everyday exposure to automobile exhaust gasses or second-hand smoke can contribute. People who smoke regularly will have raised CO levels of between 20 and 40 ppm. And since CO can take from six to eight hours to start to leave the bloodstream and only about 0.5% is removed from blood every four (4) hours, exposure to relatively small amounts of CO, for many, can greatly decrease cognitive performance and increase health risks. In aviation, CO is a by-product of the incomplete combustion of fuel which contains a high volume of carbon. This is primarily found in exhaust gasses in most piston-powered General Aviation aircraft. Though most exhaust systems adequately vent exhaust gasses well away from the cabin, there always remains a risk of seepage into the cabin to affect the pilot(s) and passengers. Because many General Aviation aircraft are flown solo, incapacitation by CO carries an even greater risk. As noted by the items listed above, as an aircraft ages, the risk of CO in the cabin greatly increases. Additionally, experimental or homebuilt aircraft should also take great care as modifications in design or build quality may greatly increase the CO risk in the cabin as well. And as the weather gets colder, CO becomes an even greater threat as many cabin heat systems in light GA aircraft utilize baffles around exhaust systems as a source for warm air -- even the smallest fatigue crack could prove deadly. Unpressurized aircraft that operate at higher altitudes in mountainous areas are at even more risk, as CO poisoning combined with mild Hypoxia multiplies the risk. "But, I can smell my exhaust, so I should know..."
Though exhaust can have a smell due to sulfurs and other compounds in the mixture, it is not a good detection tool. Though odor may have dissipated after combustion, the concentration of CO may still remain high when entering the cabin. Smell is NEVER a reliable indicator. "What are the symptoms of Carbon Monoxide Poisoning?" The onset of drowsiness can happen very quickly, so action must be taken quickly to decrease exposure to CO and reverse the concentration of CO in the blood as unconsciousness is inevitable. 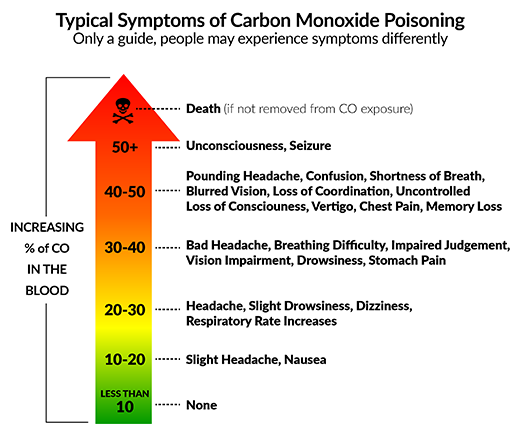 Self-diagnosis is extremely difficult, if not impossible, because CO poisoning symptoms are very similar to Hypoxia. 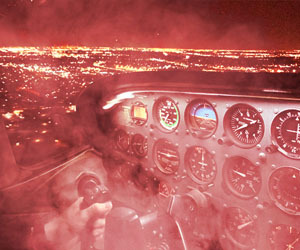 Like Hypoxia, pilots and passengers may develop a euphoria or false sense of security due to the low oxygen levels in the blood. Pilots who have survived accidents or incapacitation due to CO poisoning recall feeling symptoms, but due to decreased cognitive function, merely discounted them by attributing them to something else. Commonly found at consumer stores for use in homes, electronic household CO detectors are traditionally low cost, so many think this can protect them. However, household detectors have a very high PPM threshold that must be met before an alarm sounds. This is because when household detectors first came on the market, there were thousands of false alarms and emergency departments were overwhelmed by responding to them. As a result, Underwriters Laboratories (UL) now requires that any household detector must not indicate CO levels less than 30 parts per million (PPM), nor alarm at levels below 100 PPM. Because the amount of airflow and air mass within a home is much larger than that of an aircraft cabin, momentary spikes in CO in a home may not be as much of a cause for alarm, but in an aircraft it could be deadly. And because most of these detectors run only on batteries and have no self-test on startup, it is very difficult to know if they are working and accurate most of the time. We see these in pilot shops and in aircraft all the time – a card placed on the instrument panel with a dot in the center that changes color or turns black in the presence of CO. These are inexpensive and do not require any sort of installation, but don’t make a judgement by the price tag. Though they are better than nothing, most pilots don’t realize that these have a useful life of only 30 to 60 days – so whether you fly the aircraft or not, you have to change these cards 6-12 times a year! Additionally, they are extremely vulnerable to other aromatics in the cabin, so cleaners, solvents, and deodorants may decrease their effectiveness even more. But even more dangerous, these chemical detectors are incapable of detecting low levels of CO, which when exposed to for longer durations, can cause major symptoms. These chemical spots may begin to subtly change color at 100 PPM, but you may not see a major change until the 200-400 PPM range. By that time, you may be feeling the symptoms of CO poisoning already, so do you think you might be aware enough to detect if that “spot” is darker than before? We have seen aircraft come into our shop with a spot card on the panel that is 2-3 years old… at that point, it is more of a danger than a solution… one that creates a false sense of security and complacency when it comes to CO risk. 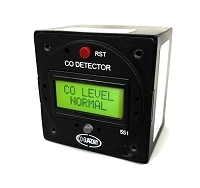 Carbon Monoxide detectors specially designed for aviation use should be your first choice in CO detection. 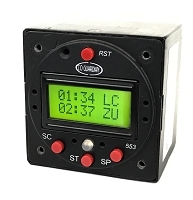 These detectors have instantaneous CO detection alarm thresholds set for far lower PPM levels than household detectors and have a visual and aural alarm that alerts a pilot or passenger much more effectively than a chemical detector. Carbon Monoxide detectors for aviation from Guardian Avionics will alarm when carbon monoxide levels measure greater than 50 parts-per-million (PPM). A loud 85db aural warning will sound and an amber warning LED will flash when CO measures 50 to 99 PPM over a 3-5 minute span. An aural warning and a red LED flashing warning will trigger when levels climb above 99 PPM immediately when detected. Every Guardian Avionics CO detector performs a self-test on each power up – so you will know each time you fly if your unit is performing within limits and accurate. 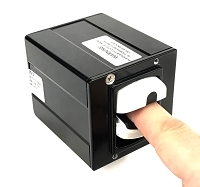 Installed detectors from Guardian Avionics have sensors that are approved for and will remain reliable for 5-7 years before sensor recalibration and the portable detector line have a three-year lifespan before recalibration. 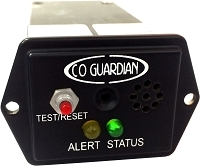 Guardian Avionics has been the leader in aviation Carbon Monoxide (CO) detectors for both certified and experimental / homebuilt General Aviation airplanes for nearly 20 years. Our Carbon Monoxide detectors are installed as standard safety equipment in all single engine aircraft currently being produced by Cessna, Cirrus, and Diamond and are equipped in select models from Piper, Gipps/Mahindra, and Beechcraft. Guardian Avionics has an entire line of Carbon Monoxide detectors to meet your needs… from portable units, to panel installed units for both Part 23 certified aircraft and experimental aircraft, and up to multifunction units or remote units that report alarms and levels on avionics products from leaders like Garmin, JPI, Dynon, EI, MGL, Grand Rapids, and more. Take advantage of your next annual inspection and install a Guardian Avionics Carbon Monoxide detector in your General Aviation aircraft. Do it for your own safety, and the safety of your passengers. 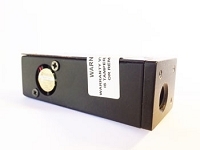 See the entire line of Guardian Avionics CO detectors for aviation at this link.